Buffalo Grove (60089), Arlington Heights (60004/60005), Long Grove (60047), Deerfield (60015), Glenview (60026), Lincolnshire (60069), Northbrook (60062), Prospect Heights (60070), Riverwoods (60015), Vernon Hills (60061) and Wheeling (60090). 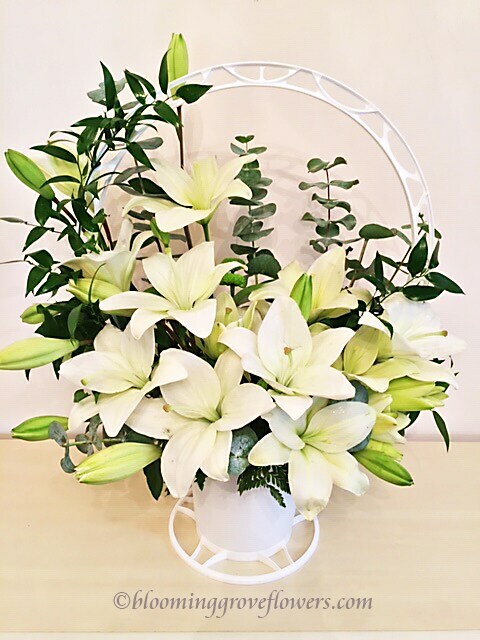 Let Blooming Grove Flowers & Gifts be your first choice for flowers. Welcome to our online shop open for orders 24/7. Phone orders are accepted Monday - Friday from 9 AM to 6 PM CST and Saturday from 9 AM to 3 PM CST @ 847.215.7770 or 847.414.8994. We are closed and do not deliver on Sundays, except for funerals by prior arrangement. Deliveries requested online for this day will generally be delivered the following business day. For on-time delivery during the busy holidays please refer to the Home page message explaining our holiday schedule/order cut-off days. Our shop will always be closed on the following holidays: New Year’s Day, Easter, Memorial Day, Independence Day, Labor Day, Thanksgiving Day, and Christmas Day. U.S. orders must be received before 12:00 p.m. (noon) CDT to assure same-day delivery. Orders received after that time will be delivered the following day (exceptions possible, please call to discuss). We will do our best to accommodate deliveries at specific times of the day, but we cannot guarantee it. Sunday deliveries avialable for funerals/ services. Please call first to discuss order minimums/ delivery fees. We will accept your international order if you call our shop directly (sorry we are unable to accept international orders over the Internet). If you have any questions or need more information, please contact us directly at (847) 215 7770. We're always here to serve you and make your flower-sending experience a pleasure.